– You find yourself tuning your ukulele a lot more than usual. – The string doesn’t feel as smooth as it used to feel. There might be some grooves in it due to pressing strings over the frets. – The sound isn’t as clear, bright, and loud as it should be. If your pickup system uses batteries, be sure to unplug it during breaks. Keep spare batteries in your case for when you need them most. Also, when restringing, replace one string at a time to maintain even pressure across the bridge saddle. If you would like to install a pickup into your uke, TW proudly offers 3 different pickup systems which you can purchase through any one of our dealers. Of course, be sure to have all pickup systems installed by a qualified instrument repair technician. 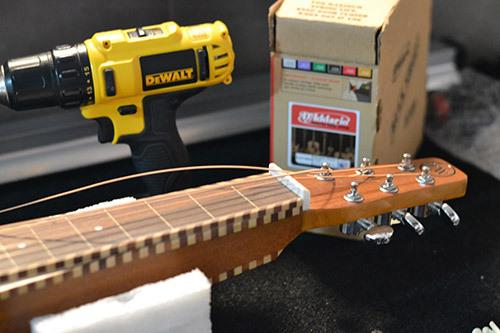 Before dispatch, your guitar will be securely packed to help ensure a safe delivery. We will have already set up your guitar to achieve optimal playability. The first thing you will need to do is to tune your new guitar. Great care must be taken when choosing your tuning. Too high of a tuning, or too large gauge of strings can cause damage to the guitar. Recommended tunings are (G) DGDGBD, (D) DADF#AD and (C) CGCEGC. There is a wide range of different tunings that you can experiment with as you grow in confidence. 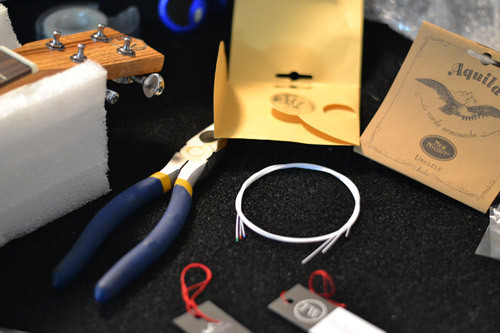 A balance must be achieved between string gauge and the keynote, to ensure the string tension is never too high. Your instrument has been strung with D’Addario EJ-17 (13-56) med. phosphor bronze strings. When cleaning, use a damp lint-free cloth then buff with a clean dry cloth. The fretboard and bridge will periodically need treating with mineral oil to avoid the exposed wood from drying out. It is a good idea to lubricate the tuning machine heads once a year with a heavy lubricant, such as Vaseline, to help keep them moving freely.